4) Overruling Roe would not make abortion litigation go away because new questions would arise, such as whether a life exception is constitutionally required and whether states can ban methods of contraception claimed to operate as abortifacients, as well as potential federalism challenges to national abortion laws. Here I want to focus on the particular line drawn by the Ohio bill: a heartbeat. I begin with an embarrassing fact. 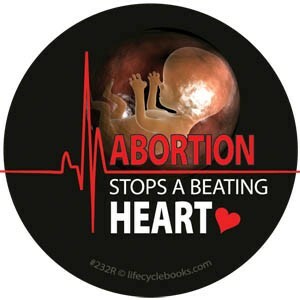 My recent book with Prof. Colb is titled Beating Hearts: Abortion and Animal Rights. Doesn't the title suggest that a beating heart is the sine qua non of a being deserving of moral consideration--whether that being is a fetus or a non-human animal? The short answer is of course not. At no point in the book do we state or defend the position that a heartbeat is a morally relevant marker for rights. Instead, we argue that sentience--the ability to have subjective experiences such as pain and pleasure--is the basis for interests and thus rights. Interestingly, the bill that Kasich did sign--which bans abortion after 20 weeks--is premised on the proposition that this is when fetuses are capable of feeling pain. We explain in the book that such pain-capable abortion bans reflect the view that sentience grounds rights. Meanwhile, having a heartbeat is neither a necessary nor a sufficient condition for sentience. We can imagine sentient beings such as extraterrestrials or advanced robots with very different physical compositions who have neither hearts nor organs analogous to hearts. Conversely, modern medicine sometimes keeps a heart beating even after the person whose heart it was has suffered brain death. Ah, but the skeptical reader interjects, why do both movements emphasize beating hearts in their messaging if not because there is some moral significance to a beating heart? Let me suggest three answers. 1) It's a metaphor. In our language, we frequently say that activities that we know occur in the brain (or the nervous system more diffusely) are centered in the heart. We speak of heartache and heartsickness. We symbolize love with a heart. We use the word heart to connote empathy as well as courage. These ways of speaking are not meant literally by people who have any familiarity with vertebrate anatomy and physiology, but they are sufficiently ingrained that activists can effectively play upon them. 2) Although, as I noted above, a heartbeat is neither a necessary nor a sufficient condition for sentience, it is usually associated with sentience. For most of the time that a being is sentient, he or she has a heartbeat, and for most of the time that a being has a heartbeat, it is sentient, at least if it is the type of being that is capable of sentience. (There are borderline cases. For example, most insects have a kind of heart, but it is not clear whether they are sentient.) It is possible that in referring to beating hearts, anti-abortion and animal rights organizations mean to trigger moral views about sentience, not heartbeats per se. 3) At least for the pro-life movement, an appeal to a heartbeat is a strategic means of moving public opinion and the law closer to the movement's preferred outcome, which rejects abortion from conception onwards. A heartbeat is, after all, a marker of life, and the orthodox pro-life position is that what entitles a human zygote, embryo, or fetus to avoid abortion is the fact that it is a human life. As I noted above, a heartbeat is not in fact a perfectly reliable marker of sentience or even what we now conventionally regard as life. For example, doctors will artificially keep the heart of a braindead organ donor beating in order to preserve the organs for transplantation, but we know that the person is already considered dead because we only allow essential organs to be donated after death. By playing on the association of a heartbeat, the "beating heart" meme serves the purposes of the pro-life movement, even though people in that movement actually think that abortion is immoral before a fetus has a heartbeat. Finally, I do not mean the foregoing entries on the list to be mutually exclusive nor do I mean the list itself to be exclusive. Mike's earlier DDE post addressed certain military decisions and issues of morality. Military decisions have destroyed heartbeats of many over the years. Laws have not stopped such destruction. A woman's personal decision concerning her body is far from war. There should be greater concern with heartbeats lost in wars, enhanced by the military-industrial complex that provide some with economic advantages. The audio of the Verdict piece stops at about two minutes. One pushback on current doctrine that comes to mind involves the Eighth Amendment. There was some concern that the Supreme Court going too far regarding what was unconstitutional per "evolving standards of decency" is that it is a one way ratchet that shuts the door to going back. I question this -- there should be various ways, including legislative resolutions and societal judgments, to perhaps determine such and such is now considered "decent" again factoring in everything. I'm loathe to support regression here in most cases personally, but probably can accept certain scenarios. Just a quick thank-you to Joe for the audio issue. I've alerted the tech folks at Verdict, but they're on west coast time, so it might be a couple of hours before it's fixed.